This week I thought I would once again combine What We're Reading Wednesday and Five Favorites to take a look at my five favorite Christian Books for Toddlers! Since Housewife Spice's WWRW is focusing on Advent, we'll start out with my absolute favorite book for the season! This is one of my all time favorite books from childhood. Sadly it is out of print, but you can still find it online at used bookstores. I love this book for its poetry, beautiful images, and simple telling of how the entire Christmas story fits together. Of all the kids' Bibles in our house, this one gets used the most! The stories are short and all told through rhyme. There are only a few verses per page, so there are lots of pictures to go along with each story. My husband actually remembers loving this when he was a kid! They especially like the Christmas story in this book because it starts with the donkey going: "Clip Clop, Clip Clop!" 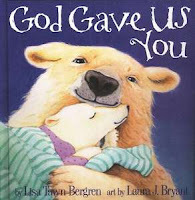 This is a charming story about how little bear came to be a part of mama and papa bear's family. On each page the line "God Gave Us You" is repeated. We often read this as our last book before bedtime. It's such a nice reminder to the kids both how they are loved by us and how they are loved by God. This book was a gift to us at Blaise's baptism. 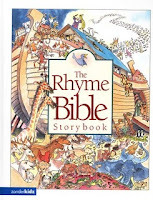 When Blaise was younger, we read this book every night at prayer time. Each page says a prayer for a specific thing - parents, grandparents, siblings, pets, etc. We still read it occasionally, but even when we don't read it, the ideas have shaped our prayer time for the better. Although not explicitly Christian, this book speaks about unconditional love that follows you wherever you go. The words are lovely and poetic, but the best part of this book is the pictures. We love Tillman's artwork so much that we have three images from her books hanging in our living room! Why is it that best books are the out of print ones? And illustrations. Illustrations are so key. I'll have to check out book illustrated by Tillman.